FREE SHIPPING TO 48 STATES ON ORDERS GREATER THAN $65. My cat peed on my expensive couch. After trying two other useless products my sister said try the anti icky poo. I tried the pre treatment and the anti icky poo. The miracle happened and the odor went away. 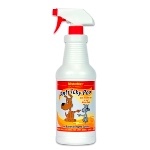 Just tried Anti-Icky-Poo and it is absolutely the best for removing pet odor. I have two cats who just had major surgery and they are not moving around much and deficating/peeing on my bed because that's where they are staying. Tried this because got a sample with the Almost Invisible Cat Litter and WOW! It really, really works in just a matter of a minute. I like this spray because it neutralizes odors and smells pretty good to. I can still smell some cat spray after 1 week, but the cat hasnt gone back to the spot. Need to try the spot cleaner next. My little chihuahua is diabetic and can't help peeing quite often. Consequently she has made my mother's room reek of urine. Luckily I found out about anti icky poo via Facebook, bought it, and now my moms room smells decent again. I will keep applying the spray weekly for good measure. Thanks Anti Icky Poo! thank goodness for this product! My golden retriever had a grand mal seizure on the back seat of my car, totally soaking the seat with urine. The emergency vet suggested antiickypoo. It arrived a couple of days after I ordered it & I promptly sprayed the leather seat & seat belts. Following the directions, I sprayed again 4 - 5 hours later & allowed to air dry. It WORKS! No bad smells! I highly recommend it! My neighbor who is a Vet recommend this! I rescue, strays so when trapping and taking males to the vet, once in a while a my protection isnt enough to protect the carpet in the tail gait of my SUV. The odor of an un-nuetered male is awful, ive tried everything. This product is the only thing that has actually gotten almost all of the odor out! Im on my third spraying after about four weeks now my husband thinks the smell is gone. My nose is a little more sensitive so when then it get really hot and humid again i will see, but for now , so far so good! I tried it and so far my cat has not sprayed. I also like the fact that there is no odor, no perfumes or chemical smell. I does not harm the fabrics that I spray it on. I have and will continue to recommend this product.